17a [Clearly visible] is PLAIN TO SEE. 28a [Hoity-toity] is LAH DI DAH. 45a [Sets lofty goals] is AIMS HIGH. 59a [What egotists use instead of “I”] is THE ROYAL WE. No rhymes, no internal words, nothing in common that I could see. So I scanned the clues. Aha! 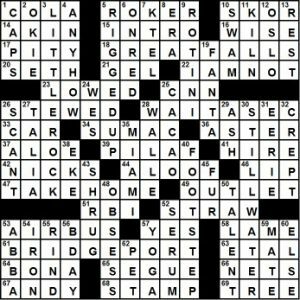 The very last Down clue is 61d [“That’s correct” … or a hint to the ends of 17-, 28-, 45-and 59-Across, in different languages]. The answer is YES. If you say the last words out loud, they sound like SI, DA, HAI and OUI – YES in Spanish, Russian, Japanese, and French. Nice! 6d [Neighborhood to get kimchi and bibimbap, informally] is K TOWN, for Korean. I know there’s an area of NYC called K TOWN, and I’m sure there are others. 11d [Latin motto for a go-getter] is CARPE DIEM, which is the classical version of YOLO. 34a [Holders for emergency supplies] are GO BAGS. I know this term from hospital disaster drills. 41a [Follower of Lovers’ or Lois] is a charming clue for LANE. 65a [“Terrible” years for kids] is TWOS. I found three much more challenging, to be honest. Two happened to her. Three was on purpose. What I didn’t know before I did this puzzle: that LARCHes lose their needles in the autumn. Someone still needs to change the clock that determines when the WSJ puzzle drops, because it’s still appearing an hour later each night than when it’s supposed to. Ergo, I’m going to keep this brief. Our theme is a chronological history of recording media which I found interesting even though I didn’t grok the theme until after I’d finished. Cute. Although DVD and Blu-Ray are not to be found and “the cloud” isn’t really a medium. The data is still stored on a drive somewhere; it’s just that that somewhere is remote from your location. But that doesn’t really bother me. I find the theme charming in a modern way. I especially like that each word in question is used differently in the entry. This is most notable with CD RATES. 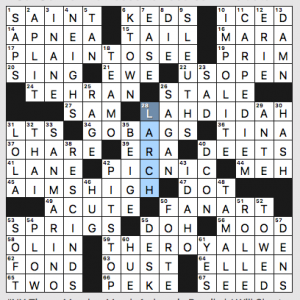 Highlights in the fill: KEEP TRYING, SUPER-SIZES, MALARIA, MERLIN, PAY-DIRT and fully-named JAY LENO. Lowlights: The clue for ZOO [Cagey sort of place?]. That’s kind of depressing. 61a [Dessert wine at a card game gathering?] BRIDGEPORT–Historic seaport city in Fairfield County, Connecticut, pop. 146,579. I don’t see what gathering adds here. Drop it, change at to with, and you’ve got a shorter clue. 3d [Radio format with mostly pop and rap?] LITTLE ROCK–Capital of Arkansas, pop. 198,606. And where I’ve lived since 1975. Seat of Payne County, Oklahoma, pop. 46,560. I get a great visual from this clue. Two one-worders, two two-worders. Good balance. And with a 10-10-10-10 theme in a pinwheel, I expect good fill all over, and I AM NOT disappointed. I don’t have to WAIT A SEC to TAKE HOME several more ILSA’s that are RIGGED UP in the grid. Including ANYHOW, ON RED, FOOTSTEP, OUTLET, and AIRBUS. This is a solid Monday theme. I like that each of the themers starts with a common synonym of the others, and my only nitpick would be that lone, solitary, only, and single are adjectives while one is a noun. Aside from that, thumbs up from me on the theme. The only women referenced in the puzzle were SIGNORA, Buffy the Vampire Slayer in the clue for 3D, and Jill in the clue for 37D. That’s it, and that’s a bummer. 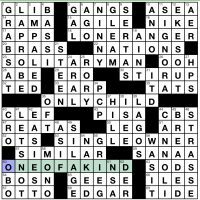 If you compare that with the number of men in the puzzle (RAMA, TONTO, The Lone Ranger, Neil Diamond, SOLITARY MAN, ABE, TED, Bobby Kennedy, EARP, OTTO, EDGAR, STEEN, RORY, Jack, and GRIEG) and the fact that some of the fill could have been clued via women (including NIKE as the goddess), the disparity is really apparent. I also didn’t quite enjoy BOSN, LAPROBE, or the alternate spelling REATAS. Otherwise, a pretty easy sail. Thing I’d never heard of before: [20a: Antenna enclosure that often resembles a golf ball]: RADOME. I looked this up on the ol’ Wikipedia and saw pics of many familiar looking radomes. It’s a portmanteau of radar and dome, which makes perfect sense. Show that more people should watch: [44a: HBO dramedy on which Solange Knowles served as music consultant]: INSECURE. Starring popular crossword grid denizen Issa Rae. Piece of trivia that I knew: [12d: It’s usually thirty, for television]: FRAME RATE. And 24 for most of the sound film era. This entry was posted in Daily Puzzles and tagged C.C. Burnikel, Freddie Cheng, Jan-Michele Gianette, Kameron Austin Collins, Kurt Mengel, Mark McClain, Zhouqin Burnikel. Bookmark the permalink. Another tedious trivia test from Mr. Collins at the TNY. Enjoyed the BEQ as usual. Maybe KAC doesn’t really have his heart in it. Maybe he never really has. I realize this is coming two days late, but regardless of your reaction to the puzzle itself, comments like “KAC doesn’t really have his heart in it. Maybe he never really has” are laughable at best and incredibly sad at worst. It seemed less trivia-heavy to me than the puzzle often is. I had trouble with PORNOFILM before correcting it but otherwise it was not too tough. I agree that NPRTOTE is weak. I tripped up on the BEQ, on the other hand, because of phrases in the NW that I wasn’t familiar with. Yes this was hideous. NFL TRADE RUMORS are not really a Thing. SWEET CREAM just below ROTTEN IDEA. Very roll-your-own. 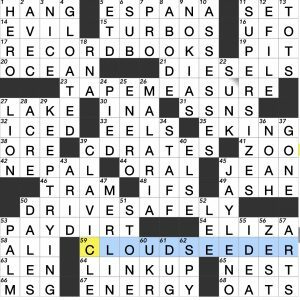 As a (perhaps rare) sports fan / TNY crossword solver, NFL TRADE RUMORS really threw me off. First of all, February is way more known for the NBA trade deadline, which (coming mid-season) is generally more active and entertaining than the NFL one. NFL trades aren’t allowed to occur until mid-March, though I guess you could start reading about rumors before then. I thought this one was on a par with a good Stumper, with mostly common phrases clued wickedly. I only had to use mr. google once, at 3D, to help finish up the NW corner. I liked the image of an NPR tote at a farmers market. One person’s green paint is another’s lovely stack. Oh well. WSJ: Jim, based on the puzzle’s title, “Changing Tracks” (tracks beings songs), I think the theme is specifically about music recordings, not recordings in general, which is why DVDs and Blu-Ray are not included. If interpreted that way, it is very tightly conceived indeed, as the chronological march of music origination did indeed go from vinyl records to tape (both cassette and 8-track) to CD to drives (digital downloads) to “The Cloud” (streaming). Pity about “wax” because that has an alternative sense too (as in “wax poetic”). But I suppose that “wax” without “cylinder” wouldn’t click as part of the theme. That was a picture-perfect Monday NYT for me. 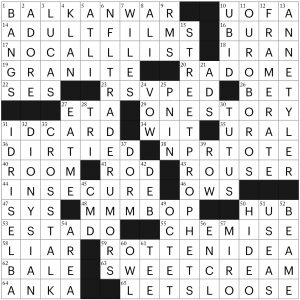 Easy but fun, with a cute theme, and I’d like to think a good puzzle both for new and experienced solvers. Hey, fiends, did you see this? Max Deutsch, a young “rapid-learner” took on the Saturday NYT xword as a challenge. Read to the end.